This is a hospital medical malpractice lawsuit filed on behalf of an infant girl in Baltimore City on April 13, 2017. It is the 175th medical malpractice case in Maryland in 2017. A girl is a patient at University of Maryland Medical Center. A PICC line (used for long term IV blood draws or medications) is placed in her left arm. A nurse intends to place a PIV saline lock line into a vein in the girls left arm for blood transfusions. 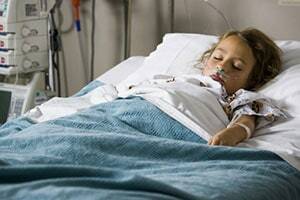 She places the line and it remains there or five days during which time the girl receives several blood transfusions. After five days, the girl has duskiness in her fingers which progresses to part of her forearm. A duplex vascular scan is done, which shows hemodynamically significant stenosis. It progresses to necrosis, causing all five of the fingers in her left arm to be amputated. The girl's parents file this claim for her, alleging that the staff failed to properly place the PIV/Saline line in her vein but instead placed it into an artery, and then failed to monitor her change of status in failing to recognize the signs of vascular insufficiency. The big unanswered question is why this child needed a PICC line and whether the child was an outpatient. PICC line placement can be verified with an x-ray. Was this done after the initial placement? If so, when did it move? These are going to be key questions. Over 5 million central venous catheters are inserted every year in the United States. Inadvertent arterial injuries occur in about 1% of PIC line insertions. Yet there are few PICC related malpractice lawsuits. Most likely, this case involves a carotid artery dissection. This is a separation of the layers of the artery wall supplying oxygen-bearing blood to the head and brain and is the most common cause of stroke in children. The tearing of the wall of the carotid artery causes the accumulation of blood within the wall of the carotid artery. The accumulation of blood within the wall of the carotid artery causes the hole of the carotid artery to narrow or become completely blocked. The narrowing or blockage of the lumen of the carotid artery can lead to blood clot formation. Have you or someone you known suffered an injury due to the negligence of a hospital? Miller & Zois can help you get the compensation you deserve for the harm you have suffered. Call us today at 800-553-8082 or get an online case review.